Kyle Boller came in and played well enough for a win. A win is a win, right? Yes. The Raiders beat Cleveland yesterday at home 24-17 on a day in which they paid tribute to their deceased patriarch, Al Davis. And while they are happy to have won to go two games over .500, they also lost. Quarterback Jason Campbell, broke his collarbone in the 2nd quarter and didn’t return. In fact the next time he’ll be in pads will probably be in a mini-camp next March. The Raiders QB had developed nicely into a system built around Darren McFadden and the running game, but will now have to help by holding a clipboard. If he can even do that. 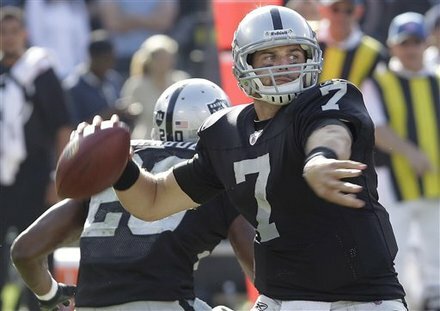 Kyle Boller, the former Cal QB came in to replace Campbell and threw one fewer touchdown passes then the Raiders punter. He was 8-14 for 100 yards. Shane Lechler was 1-1, for 35 yards and a score. That’s because the Raiders coaches pulled off another great trick play, and this one may have won the game. Facing a 4th and 20 from the 35, the Silver and Black lined up for a 52-yard field goal. Instead, holder Lechler threw to a wide open Kevin Boss in the flat who only had three cheerleaders and a photog to beat to get in the end one. That made the score 24-7, and after a brief scare at the end when the Browns cut the lead to 24-17 and recovered an onsides kick, they hung on. Now they have to look ahead and see if they can continue winning with Boller, or go outside the organization and get a QB. For now, they’ll probably do both. Boller will start this Sunday against Kansas City , and the Raiders will get another quarterback at some point this week. And that quarterback will come into a pretty good situation. McFadden leads the NFL in rushing with 610 yards. He is a true weapon and at age 24 the face of the franchise. 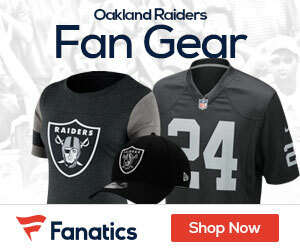 And while Al Davis was many things, being the face of anything was not one of them. That quarterback will also have a receiving crew that is coming together. Darrius Hayward-Bay caught 6 passes yesterday and now has 17 in his last 3 games. Jacoby Ford also caught 3 passes, but showed he was healthy once again on an electrifying 101 yard kickoff return. Add in Boss at tight end, and the Raiders have some bullets. They just don’t have a gun. And that is one thing you could always count on from Al Davis. He knew where to get “the gun”. That bum QB Jemarcus Russell who drank the purple juice was certainly not a gun. Boller is solid enough though. Raiders going in right direction this year for sure.